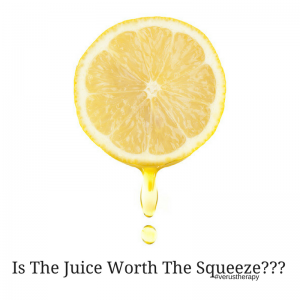 Is The Juice Worth the Squeeze??? Is it worth the squeeze? Will it be worth it to unpack all of the emotions? Will vulnerability really taste that sweet? You’ll only know, if you try…. Real, deep love requires conflict, impasses to work towards growth, together. Modern couples today, as soon as conflict, tension arises, they fear it’s the demise of their relationship. For some, it may be- but if you don’t risk squeezing, going through the impasse, you’ll never know what your relationship could look, feel & taste like after the squeeze. Therapy doesn’t always feel good right away. Similar to when you want juice and realize you may have to actually squeeze the fruit to get juice. You don’t want to put the hard work in, you want it already done for you, pre-packaged juicy goodness. Relationships don’t come prepackaged, you have to do the hard work! Couples need tools to do the work together. What are these tools?? Millennial modern, married-or-not married long term couples enter my office having the tools for fun, enjoyment, and pleasure. But tools for dealing with conflict, impasses & vulnerability, not so much! Which leads to couples quickly calling it quits as soon as it gets hard. But, there’s another way! Warning.…it requires work! Sit down prepared to have a REAL dialogue about what’s working and not working in your relationships. Come up with 2-3 things for each category. Put your phones, any distractions completely away, in a separate room. Then, sit down, face to face. YES, I know, scary they may actually SEE you. See that you’re in pain, that you’re hurt. Or worse, they may actually HEAR you. But, this is where connection is built. Start with what’s working! Then what’s not working. Take turns sharing, not interrupting each other. Reflect back what you’re hearing. Create a specific plan together, to start to change what’s not working in your relationship. Check back in, in about 3 weeks and repeat! Forever. You’re always going to be thirsty, which means you’re always going to need to be working together, through conflict & impasse. Learn and practice the tools when it’s not so rocky, so when it’s more challenging, you two already have a system in place to communicate and work together as a team. It’s okay, if things remain on the not working list for some time, all it means is the two of you are still working. Relationships require constant work. Happiness, ease, passion are important in relationships, but they also require resilience & vulnerability to overcome obstacles, together. Stop running or avoiding obstacles that you see in your relationships. It’s hard work, but it’s worth it. The juice is worth the squeeze! Does Your Partner Have A Secret Ambition? Do You?